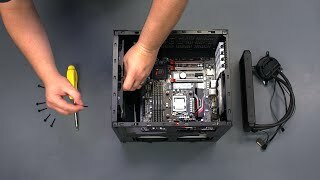 Really the best cube case for matx mobo. Big, stable and really quite. Great cable managment and fans upgrade. So much room for activities! The dual zone design made building and cable managing a breeze not to mention the construction is extremely solid with plenty of room for expansion and any form of RAID array or Cooling solutions you wish to use. This is an HTPC case but with so many hard drive bays, SSD mounts, pcie slots, etc. I couldn't resist. Has great airflow and is easy to dust when needed. Looks great, has slim slot optical drive, fan controller and 3x 120mm fans included. But slim slot mounting gear may not fit properly as well as awkward cable management positions. Its amazing to find a small case like this one with so many features, especially the hidden disk drive. Although I only paid $50 for an open boxed version, it would be completely worth the full cost. Building in this was a lot easier than an Air 240 case as cable routing was a lot easier overall. Couldn't use the drive caddies since I have a 280nm AIO cooler in push/pull over where they would be mounted, so I had to use the two 2.5" SSD mounts in the front cover and mount my 3.5" storage drive below my GPU. Really helped with my air flow issue coming from a Corsair 350D and I'm pretty happy with it. [NEW] This is the core of my build. I never thought about anything else than ATX. But when I started looking and reading about parts and setups I stumbled upon mATX. The moment I saw the Node 804 I was in love and still am. I have seen many good and small cases but this one is on another level. HDD capacity, airflow, minimalistic design, window, 2-chamber ... all I wanted! The dual chamber design of this gorgeous and simple box is admirable, and I fully recommend it to anyone looking for a mid sized case with little compromise. Good looking, small factor and still spacious. Only problem is ports and power button on the side.